A bit larger than New Jersey the state of Israel is a technological and economic powerhouse. It is part of the Middle East. Its climate and landscapes are Mediterranean. This week-long tour touches many of the cultural and historic highlights this vibrant, multi-cultural country has to offer. 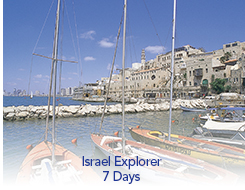 Upon arrival in Tel Aviv, Israel, you will be met and transferred to your hotel.